The latest SuperData report shows subscription service PlayStation Now ahead of the competition in quarterly revenues. According to the SuperData report, game subscription services brought in $273 million during 2018’s third quarter, 52% of which was attributed to PlayStation Now. Revenue from PS Now totaled $143 million, and EA’s Access services contributed $90 million or 33%. The differences in percentage for EA services were as follows: EA Access (Xbox One) 16%, Origin Access Premier 9%, Origin Access (PC) 8%. Xbox Game Pass contributed 15%, or $41 million, to overall subscription revenues during Q3 2018. 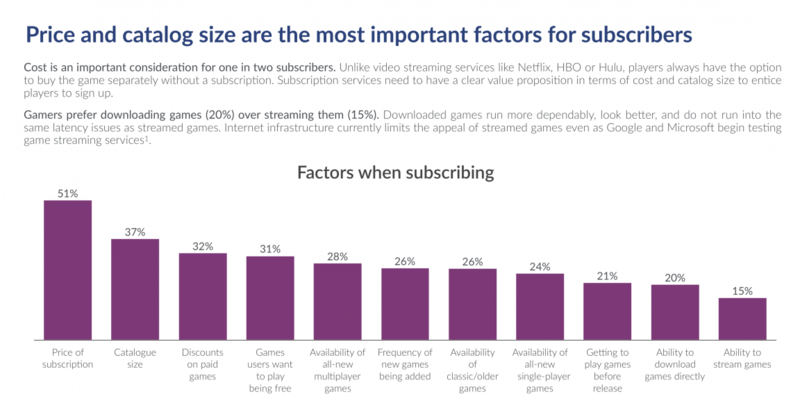 SuperData’s report also found subscribers tend to spend more on in-game content than non-subscribers. The average spent by subscribers is $25 per month compared to $10 spent by those without a subscription. Subs also tend to spend more per month on full games compared to those who aren’t subs. This averaged out to $57 a month and $39 a month, respectively. Slides from the report are below.